I write software. To write software, you think about the problem, invent a possible solution, and make a plan to implement that solution. The problem is, this plan -- call it 'Plan A' -- almost never works. Unexpected hitches develop, the problem changes, new opportunities emerge. These factors, and many more, conspire to make Plan A obsolete or unattainable. For many years, I found this frustrating. I went to RPI for engineering. I graduated out of SUNY Albany's math department. What I and many of my fellow software Project Managers searched for was a better Plan A. One that wouldn't change, and that would guarantee that software would be delivered on time, on schedule. This, as the software world discovered many years later, was an unachievable goal. Building a software program is not like building a house. It is not an engineering process that can be managed with Gannt diagrams or PERT charts. Writing a new piece of software is more like a voyage of discovery, requiring energy, resourcefulness, creativity -- and a large dollop of positive thinking. You still need a Plan A, of course. In the same way that people seem to be wired to believe the unbelievable, people are wired to need a plan: a set of goals, and a plan to achieve them. It's hard to make dinner without a plan. So, whether you keep your plans in your head or turn your computer screen into a Post-it® fringed checklist, you probably have a Plan A for whatever it is you're doing. But -- and this is a big 'but' -- you also need a Plan B. Because if Plan A fails, or priorities change, or new opportunities emerge, you're going to need a Plan B. And here's the great thing: As Captain Cook knew, there's always a Plan B. Thus, when the wooden boat that Helena and I had been looking for for years, turned up on eBay, we needed a Plan B. 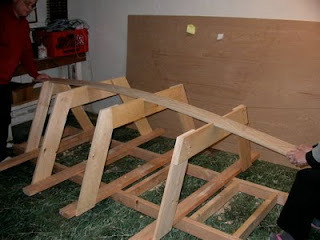 Our boating Plan A had been "build Cabin Boy this winter so when and if we buy a wooden boat, I'll know how to take care of it." We had grabbed a new opportunity when it knocked on our door, and we now owned a boat. A boat in Florida -- about 2000 nm. from home. Clearly, Plan A was no longer operative. So here's Plan B: to sail the new boat home from Florida in stages. Stage 1, the north west coast of Florida to the south east coast of Florida, via the Keys, commencing in 20 days. And for this voyage of discovery, I'd need a dingy, which means instead of taking all winter building Cabin Boy, I need to finish it in 20 days. Will I be able to finish Cabin Boy in 20 days? Who knows, but I'm going to give it the best I've got! The keelson, in Cabin Boy, is a structural member that ties the stem and stern together, and supports the bottom planking. 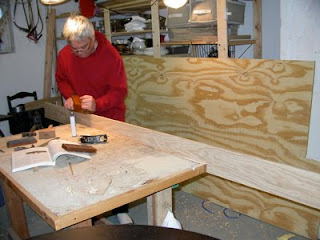 Specifically, it's a 8' x 5" x 7/16" piece of white oak. To save time and money, I decided this morning to build Cabin Boy to "work boat" standards. In other words, cheap and cheerful. But I'd been wanting to try out my new old plane, so couldn't resist giving it a few quick swipes. That's my copy of "Restoring, Tuning & Using Classic Woodworking Tools" by Michael Dunbar. Great book! Using my new old plane. Sharp! 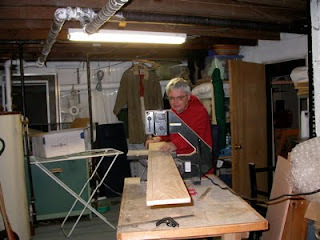 Next, it was time to notch the forms so the keelson would lie flush with the bottom of the boat. 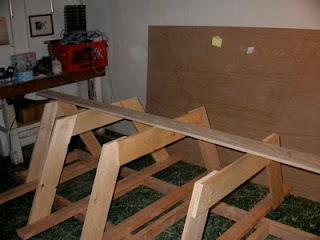 The bottom planks will eventually go on top of the keelson. Or under, depending on how you look at it. Seeing how it looks -- but the keelson needs to be *in* the forms, not on them. I used my Japanese pull saw to cut the notches. I wish I'd remembered the neat trick on page 127 of Rossel's "Building Small Boats", which is to clamp a strip of wood to the saw as a fence or depth guide, but forgot and just cut by eye. 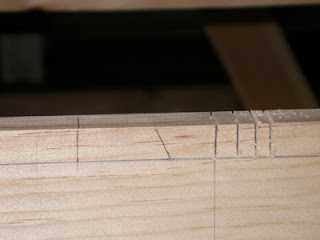 To cut notches, first make a bunch of small cuts, all to the same depth. I worried that these notches would be hard to cut, but it was much easier than I expected. A little pressure with a chisel just popped the pieces of wood out. 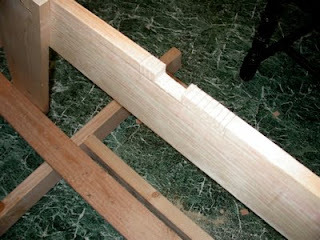 The bottom was a bit rough, but a few strokes of the chisel leveled the bottom so it was 'good enough'. This is much easier than it looks. Each notch took 5 minutes at the most to make. 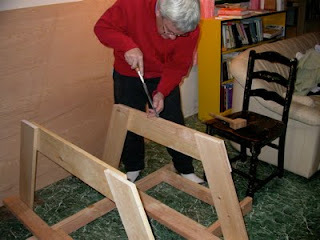 When all the notches were cut and trimmed, Helena and I tested the keelson for fit. Perfect! Notice the rise in Cabin Boy's stern. This is going to make him easy to row and sail. Beautiful! And that was day 20. Tomorrow, I'll tackle the stem. An ambitious project, John! I'm wondering, what kind of boat did you just purchase? A Tom Gilmer-designed "Blue Moon". In pretty good shape, but needs a paint job. Can't wait to get down there to work on her. But it's a big job getting organized for such a long sail. Good first day, John! With that kind of progress, you will easily make the 20 days through completion! I will be watching with envious delight. "Other" responsibilities have my quick-n diry stitch and glue 12-foot sharpie build headed for the one year mark! G'Luck! Oh - a Blue Moon! Yes, I'm familiar with that design. Gorgeous -- right along the lines of my interests! Thanks, John! Thanks for posting on trailersailing. I am a moderator on the group and we also wish you would tell the group what boat you purchased. Now that I find that you bought a boat named "Blue Moon" in Florida I can't help but wonder if it the same one we almost bought less than a a year and a half ago? It was a somewhat wooden pilot house boat that was in desperate need of deck, pilot house and more ares to be repainted. I think most the hull was ok but I don't remember everything. Oh I think it was related to a Canadian boat building company. There will be lots more on the Blue Moon as I get ready for my cruise. Wow! Nice topics, I am looking this type of topics. But I need more informations. I know a New Drafting CAD Site gives away over 100 House plans for free.